My name is Matt Alber. 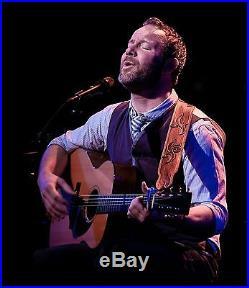 I'm a professional touring musician, teacher & two-time Grammy® Award winning recording artist based in Portland, OR. I've had a superb experience with my AVALON VT-737SP. All photos above are of the actual unit for sale except the one of yours truly on stage my one night at Lincoln Center. The Avalon VT-737SP features a combination of TUBE preamplifiers, opto-compressor, sweep equalizer, output level and VU metering in a 2U space. I've especially enjoyed the ease of shaping the sound in real time with real dials and switches. I can quickly set the gain, compression & EQ without ever touching a mouse. And the AVALON sound with its 4 dual triode vacuum tubes is just heavenly. The 32K boost makes breathy vocals sound like they're floating on clouds. Take a LISTEN to some vocals I recorded on this unit with 32K boost here. The only downside for me is that this beauty weighs in at 22 lbs. I'm not able take this on the road with me so I'm switching to a Universal Audio-based mobile rig. I'm going to miss it, but I'm hoping this fella goes to a good home. There is no damage to the unit and I've taken very good care of it. It's lived comfortably in a smoke-free studio and received a recent tune-up. Here are the Features and Specs on the AVALON 737 VTSP. The VT-737SP has three input selections: 1. The VT-737SP features a higher-performance microphone input transformer with +48v phantom selection. Instrument DI high source input with jack located on front panel. Balanced line input, discrete high-level Class A. A high gain switch boosts the overall gain of the preamplifier. The four high quality tubes are configured as singled ended anode coupled followers. A passive-variable high pass filter and hard-wire relay bypass completes the input signal conditioning. The phase reverse relay is available on all three inputs. The opto-compressor features a minimum signal path design with twin Class A vacuum tube triodes for gain matching. Two VT-737SPs can be linked via a rear panel link cable for stereo tracking. The compressor bypass is a sealed silver relay for the most direct signal path. The VT-737SP equalizer utilizes 100% discrete, Class A-high-voltage transistors for optimum sonic performance. The high and low frequency bands provide the smooth characteristics of an all passive design, while the dual mid bands include variable frequency and switched Q-width selection. The enhanced range of the mid bands is extended into the high and low bands by the use of X10 frequency multipliers. Vacuum tube triode signal path, transformer balanced microphone input, high-voltage circuits for maximum headroom to +30dB, low noise -92dB, internal discrete power supply with toroidal transformer, soft-start tube life extender, stereo link for compressors, all discrete Class A equalizer with musical passive filter design, sealed silver relays for signal routing, large control knobs with professional conductive plastic potentiometers, VU meter for output level monitoring and compressor gain reduction. Circuit topology Four dual triode vacuum tubes (Sovtek 6922), high-voltage discrete Class A. Gain Range Microphone: Transformer balanced 850/2500 ohm, 0dB to +58dB Instrument: Unbalanced 1 meg ohm, 0dB to+30dB Line: Balanced Class A 20k ohms, -27dB to 28dB. Maximum output level +30dB balanced 600 ohms, DC coupled, discrete Class A. Output type and gain XLR connector, output trim gain -45dB to 20dB. Noise microphone EIN -116dB, 22Hz to 22kHz unweighted. Distortion THD, IMD 0.5%. Frequency response -/2.5dB 10Hz to 120kHz input filter included. Frequency response -3dB 1Hz to 200kHz line in-out. VU meter and gain reduction High quality illuminated OVU =+4dB and gain reduction to -20dB. High cut filter Variable 6dB per octave 30Hz to 140Hz. Compressor type Optical passive attenuator incorporating twin vacuum tubes and stereo link. Threshold - Ratio Threshold variable -30dB to +20dB, ratio-compression variable 1:1 to 20:1. Attack - Release Attack variable 2mS to 200mS, release variable 100mS to 5 seconds. Equalizer type Discrete Class A, variable active and switched passive design. Frequency bands (4) Treble - switched 10kHz, 15kHz, 20kHz, 32kHz, +/- 20dB range, shelf High mid - variable 200Hz to 2k8Hz and 2kHz to 28kHz, +/- 16dB range, hi-lo Q Low mid - variable 30Hz to 450Hz and 300Hz to 4k5Hz, +/- 16dB range, hi-lo Q Bass - switched 15Hz, 30Hz, 60Hz, 150Hz, +/- 24dB range, shelf. AC power Internal toroidal 100v to 240v, 50-60Hz selectable, 75 watts maximum. Dimensions 19 x 12 x 3.5 in (482 x 305 x 89mm). The item "Time to upgrade from my Avalon 737-VTSP Vacuum Tube Preamp/Channel Strip" is in sale since Friday, May 12, 2017. This item is in the category "Musical Instruments & Gear\Pro Audio Equipment\Preamps & Channel Strips". The seller is "musicmanpdx" and is located in Walnut Creek, California. This item can be shipped to United States.